We’re already a few days into Hanukkah and Christmas is right around the corner. Still need a gift for the Japanophile in your life? Aside from a ticket on the first flight out to Tokyo, here are some great gifts easily found outside of Japan for that special someone who adores the Land of the Rising Sun. 1. Desktop Zen Garden – Can’t concentrate on the task at hand? Need a way to destress in the office? 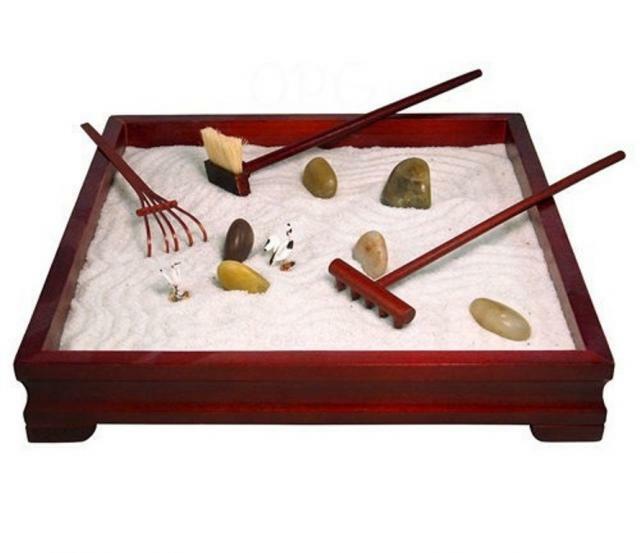 Pick up a desktop zen garden, complete with pebbles and sand rakes. Enterprising types can attempt to recreate the famous Ryoan-ji Temple garden in their spare time. 2. A Yoshida Brothers CD – If you think you’ve never heard of the Yoshida brothers, you might actually be wrong. Their music was used in multiple American TV commercials back when the Wii was first marketed in the States. These two brothers from Hokkaido take old instruments (the three-stringed shamisen) and flip traditonal music on its head. 3. A rice cooker – It might seem like such a boring, practical gift but if the cook in your life is keen to really take on Japanese cuisine, a rice cooker is an essential tool. I can’t live without mine – it cooks both my brown and white rice to slightly sticky perfection and even doubles as a slow cooker and overnight oatmeal warmer. Couple this gift with a cookbook such as Nancy Singleton’s newly released Japanese Farm Food. 4. Okami playstation game – For the gaming Japanophile, this is a must. Originally released for the Playstation 2 and now available for the Wii, this game blends myths and legends from Japan’s origins with stunning artistry. The scenes look like something out of a traditional painting and the storyline, while mashing together alot of myths, is informative and fun at the same time. 5. Green tea – It’s no secret that Japan is a tea drinking nation and green tea is getting lots of press lately for its health benefits (its loaded with antioxidants). Any international grocery store (or large chains like Wegman’s and Whole Foods) should carry a good selection. If you’re really looking to impress the recepient, choose leaves that were grown in the Shizuoka or Hirado regions, two of Japan’s top tea growing areas. Or, for an absolutely personalized gift, consider an Uncover Japan itinerary. Don’t hesitate to contact me for details! Happy holidays to all! I can’t live without mine – hope you get one soon! I actually gave the DeskTop Zen Garden to Craig Hill, who was Principal at SPCHS. Craig is part Japanese and has visited and studied in Japan. He also taught Japanese at the school. I’m hope he enjoyed it!